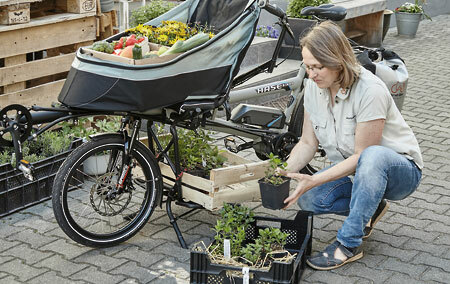 Cargo bike, family taxi, tandem: with too much CO2 in our atmosphere and not enough parking spots in our neighborhoods, the PINO STEPS is the perfect e-vehicle for the city. How can the groceries get home, your family get to the park, or a couple get to their favorite picnic spot? On the PINO STEPS, of course! 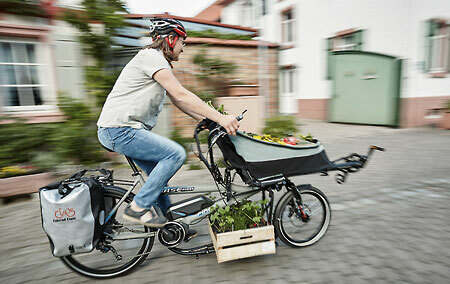 The e-tandem from Hase Bikes takes you quickly from A to B in an environmentally friendly way, and lets you easily bring along all kinds of cargo. Or your favorite co-pilot. The powerful mid-motor from Shimano can be switched on with the touch of a button when the hill's too steep, or the will too weak. The battery has a capacity of 418 watts and can be charged in 4 hours. PINO as cargo bike: let the good times roll! ​The colorful City Bag brightens up the concrete jungle and easily carries all your stuff, transforming the PINO into a cargo bike with an attitude. 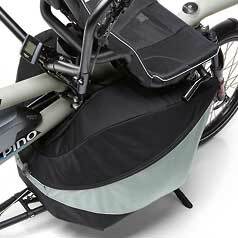 The City Bag slides over the backrest of the recumbent seat and hooks onto the frame in front. Up to 80 liters (2.8+ cubic feet) of cargo can be packed away in this attractive, sturdy, and waterproof "trunk." The robust Porter Rack below the bag is a foldable luggage carrier that doubles as a sturdy two-legged kickstand, adding even more load-carrying capacity: e.g. for that case of ginger beer or an XXL watermelon for the neighbors' shindig. PINO as family taxi: I'm front and center! It's also fine for kids to ride in a wooden crate, either alone or sandwiched between the organic leeks and baguettes. But as we see it: kids aren't cargo. And they have much more energy to burn than a loaf of bread. 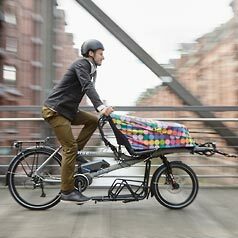 That's why the PINO keeps kids and cargo separate and offers a Children's Crankset that turns petite passengers from 3'3" in height into active co-pilots - attracting envious stares from their trailer-bound peers. After burning up all that energy, your tired stoker might just need a little nap. Which is fine, thanks to the freewheel and three-point harness. After all, Daddy has the Shimano motor as a backup, just in case he can't handle the pedaling on his own. The old fashioned "bicycle built for two" was never as romantic as it sounded in the songs. How could poor "Daisy" give her answer while staring at the back of her beloved's head and trying to keep pace with the pedaling? Thanks to the two different seat heights on the PINO, the stoker in the front recumbent seat can share the beautiful view - and pleasant conversations - with the captain. No road is too long when you share the experience. 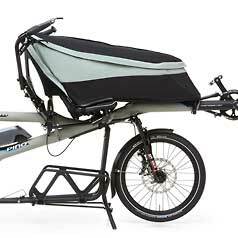 The Shimano will help you get there, and the Rack Bag under the recumbent seat lets you bring along all the provisions you need! Shoulder Pads: The optional Shoulder Pads are available for use with the Harness System. 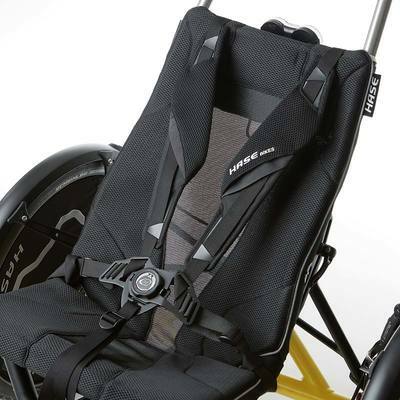 They offer additional comfort and can be adjusted for riders of all sizes. Harness System: Our newly developed Harness System with integrated child-proof buckle guard is not only user-friendly, but also versatile: it can be used as a combined lap and shoulder restraint or as a 5-point harness with an additional strap between the legs. Even more comfort can be added with the optional pads. Special Pedals: We designed our new Special Pedals in cooperation with Georg Busch from the company Ergodynamik Busch. They are much more adjustable to individual needs than other models: for starters, they fit an impressive range of shoe sizes, from US kids' 1/UK kids' 13 / EU 32 to US men's 16 /UK 15.5 / EU 52. And the angle to the direction of travel can also be adjusted over a very wide range. 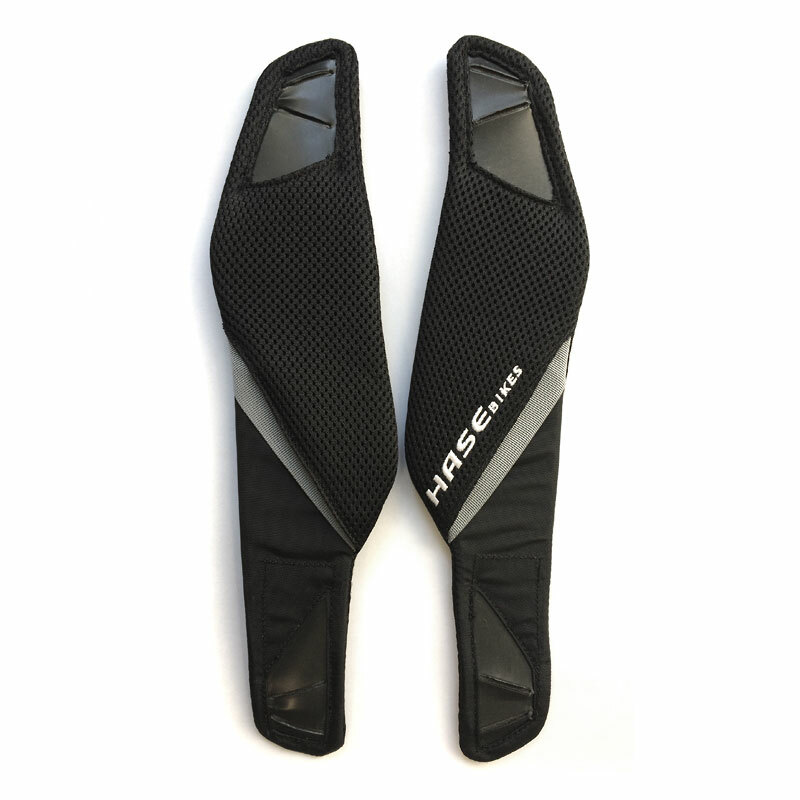 Once all adjustments have been made, the straps can be easily fastened and released with one hand. The foot is held comfortably and securely in the proper position. 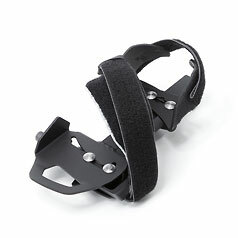 Calf Support: The Calf Support was redesigned for use with the new Special Pedals. 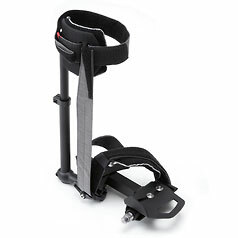 Its unique and ingenious structure provides firm support for the leg but enables the ankle to flex naturally, allowing for a circular pedaling motion. This freedom of movement - made possible by an adjustable elastomer spring - is important because, when a joint is immobilized, the muscles atrophy. City Bag: The new City Bag is an eye-pleasing highlight for our versatile tandem. Its design is extremely practical. Click, clack, and the cover is open - or closed again - with a single hand. Three self-locking magnetic fasteners hold it in place. The well-fitting cover ensures that everything inside stays clean and dry. The outer material is highly durable and tear-resistant. The City Bag boasts a carrying capacity of 80 Liters. Rain Cover: It keeps the seat dry in the rain. 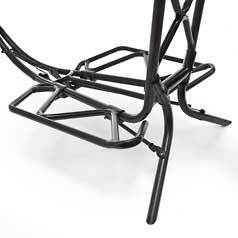 Or it can also be used for covering a seat that has become wet so that the rider's back and legs stay warm and dry. 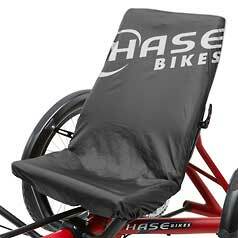 The cover does more than just protect from rain and moisture: it fits perfectly to the seat contours and has a slip-resistant surface to keep the rider in the seat if used as a cover when riding. Double Kickstand: Developed by HASE BIKES, loved by touring cyclists everywhere. The bicycle is braced for packing and unpacking and absolutely untippable, even when the front passenger has the fidgets: Can hold a total of 220 lbs (100 kg), including "lively loads." 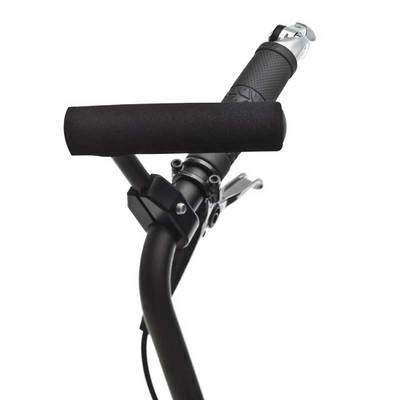 Double Grips: Whether joy ride or competition: with the additional handlebar grips, the pilot can alter his or her position as desired for optimal comfort - without having to adjust the handlebars. Porter Rack: For extra-heavy loads, the lower Porter Rack can be used in combination with the City Bag or Porter Bag and has an integrated kickstand. A special Rack Bag is also available for protecting the rack cargo from the elements. Porter Bag: The base stats: rainproof, dustproof, and an 80L capacity, which, thanks to an extra zipper in the cover, can even be expanded to 120 L. The entire BAG weighs a mere 3.5 lbs (1.6 kg) but can hold 88 lbs (40 kg). Available from spring 2014. Rack Bag: On shopping day, there's no such thing as bad weather with the PORTER RACKBAG. It creates a dry zone, encasing the unfolded rack and all its cargo. The double kickstand remains fully functional. 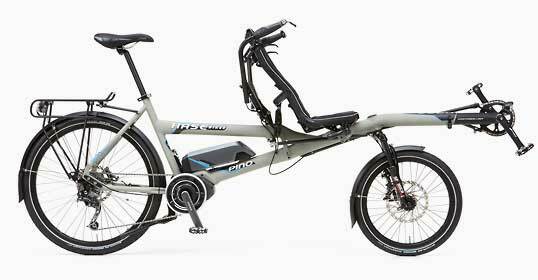 The PINO STEPS is the perfect e-bike for the city. This is the feedback we're getting from our urbanite PINO enthusiasts around the world. The photos for our catalog were taken in Hamburg, Germany, a beautiful city on the Alster river. The PINO STEPS is also perfect for an outing in the countryside, like a super-cool father-son trip with tent, fishing rod, and campfire. Fun and adventure to the power of two! Its name was PORTER. PINO PORTER. 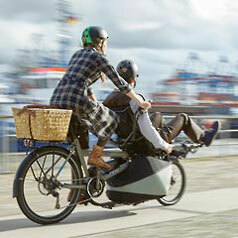 Until 2013, the PINO model "PORTER" was still being sold as the cargo bike of tandems. The ingenious Porter Rack and Porter Bag are (luckily!) still available, and in this video, Julian from Hase Bikes demonstrates how they can be used for transporting 2 crates and a large load of groceries. Silent film starring the PINO PORTER. Here is the old PORTER how-to video. It might look a little "old school," but it's still pretty impressive to see how much the PINO can carry with the right accessories. Few people have known the PINO for as long as bike dealer Monika Schwarz. 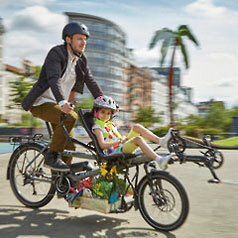 As a HASE BIKES partner for the past 20 years, she has followed the ­development of the tandem from the very beginning and has been riding her own for many years. We asked her to test-ride the new PINO STEPS for us. Who better to test our PINO STEPS prototypes than experienced bike dealer Monika Schwarz? The 46-year-old has always had a passion for anything with wheels and pedals – including adaptive cycles for special needs riders. She even worked in our manufacturing facility for several years. 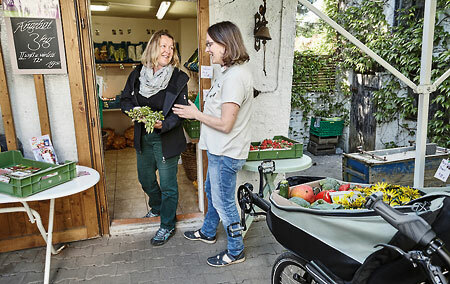 So when, in the spring of 2015, we walked into Fahrrad Claus – the bike shop she runs in Trebur with her companion, Oliver Claus – it was actually a visit to old friends. “The PINO is now a bike that can be – and is – used for many different purposes,” she explained soon after our arrival. 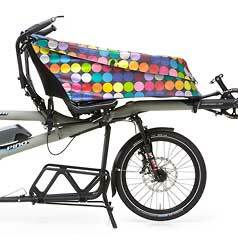 She knows all PINO model years and is familiar with the many options available for adapting the tandem to individual needs and wishes. The PINO has always played a role in Monika’s life – it was there when she needed to transport her ill sister, when she met Oliver, when she taxied her kids around, and whenever she needed to transport large loads. 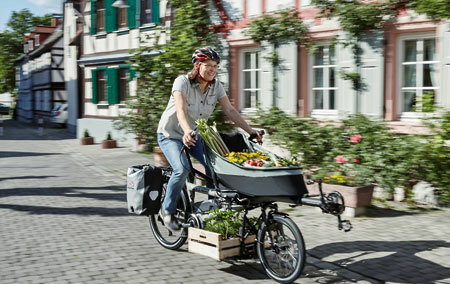 For Monika, the new PINO is the most versatile family-touring-cargo-everyday bike possible. “In all my years, I’ve never seen a cargo bike with this much carrying capacity,” said Monika. Be it produce, pet supplies, or paint cans – the PINO can handle cargo of all sizes. 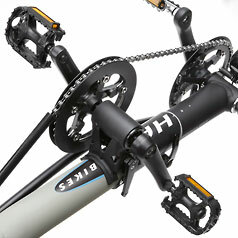 And the new Shimano STEPS e-bike ­system has no problem with heavy loads. “The ride is smooth, and the motor provides good support,” observed Monika, approvingly. 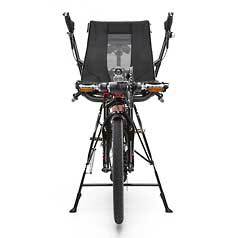 And it’s not just the unfolded PORTER BAG on the front seat that makes load-lugging a piece of cake: the PORTER RACK under the seat handles heavy loads like a breeze. From bottles to bulky boxes, the new PINO packs it in. Monika stows a tray of vegetable seedlings under the front seat. She also loves the new kickstand. 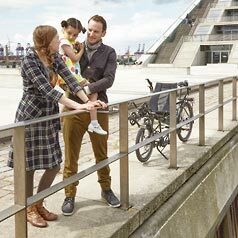 “It folds away automatically when you start riding, and it’s relatively effortless to engage, even when the tandem is fully loaded.” And the best part: when parked on its stand, the PINO is as steady as a rock! “The PINO with e-motor is my absolute favorite bike,” confessed Monika. “It used to be my kid-taxi, but now it’s my go-to bike for every errand and destination.” The best part is: “Since we’ve had the e-PINO, even Darius is crazy about shopping. Which frees up more time for me …⁠,” she said, smiling. ​“Is that the new vegetarian bike?” joked a passerby, noticing the colorful assortment of vegetables we had brought along for lunch. Catchy, but that would be a much too one-sided name for the multitalented PINO STEPS.